This plug-in allows you to copy paste UV-islands in Blender UV image editor. Functionality of this plug-in was inspired by 3D-Coat UV Tool and from Blender GSoC Project Ideas 2011. Stacking of symmetrical geometry - often times geometry that is exactly the same we will want to use the same image/texture data to save memory however, aligning the uv islands so they exactly overlap can be tedious. This would allow automatic alignment of UV islands for mirrored/symmetrical geometry. You may copy similar islands in the same UV-coordinates to save texture space. But to do so you need manualy move islands on top of each other. Also you can use snap tool, but in some cases then your unwrap complex mesh, your unwrapped similar islands are not exact same size. In such situation using snap tool vertex by vertex will be really painful. Look at following picture (click to enlarge). There are 3 pair of similar UV-islands. You can save texture space by placing each pair in the same UV coordinates. Internaly uv_island_copy_paste (ICP) relays on python-igraph module. Currently python-igraph module is only available for win32 architecture. So try it with Blender for win32. 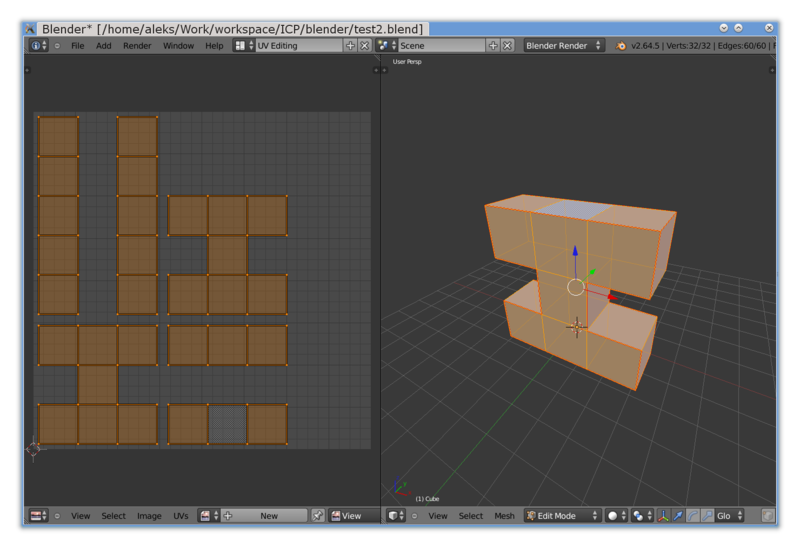 Extract it to C:\Users\Username\AppData\Roaming\Blender Foundation\Blender\2.64\scripts\addons\. Linux users have a litle more work to do. Try to search and install python-igraph package for python3.2 with your distribution installation tool first. If there is none - do not worry. You can build it manualy. Download source archive for igraph library. Extract archive, compile and install. Be sure that python 2to3 tool installed in your system. Extract archive, build and install. I will appreciate any suggestion how to embed static library for all platforms and architectures in one distribution. Currently I don't have a clear idea how to do it. In User Preferences/Addons choose Mesh category and set "Mesh:UV island copy paste" checkbox. When watch video on this page again and try it yourself. Fill free to drop me a line support-at-bytehangar.com. Or leave your comments and suggestions at my personal blog.